The biggest risk to public-private partnerships in governing is not financial or technical, but political, says Justin Marlowe, professor in the University of Washington’s Evans School of Public Policy & Governance. UW Evans School professor Justin Marlowe’s fourth — and likely final — guide to financial literacy was published in August by Governing magazine. Marlowe is the author of a new Guide to Financial Literacy, his fourth, published in August by Governing magazine. In the new guide, Marlowe writes that public-private partnerships “are here to stay … they’re now a core part of the state and local government infrastructure tool kit.” They’re also more “complex and intricate” than ever, he writes, now being used for projects including “social infrastructure” like courthouses, affordable housing, university research facilities, stormwater management and more. Government staff, Marlowe writes, can manage financial aspects of public-private partnerships with good contracts, insurance and service agreements and they can control technical risks with good designers and design processes. Policymakers, however, are harder to manage — sometimes they just change their minds. Marlowe pens the financial guides with newly elected or appointed government officials in mind. They have the job, but many come to office knowing little or nothing about public finance. 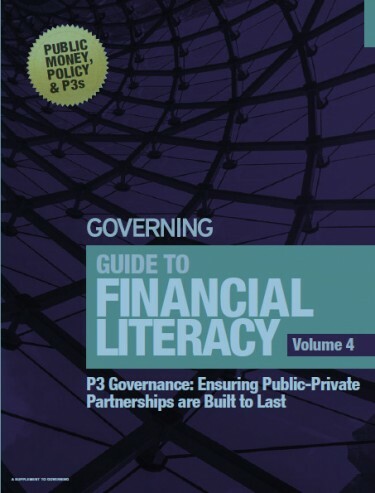 The guides are meant to help such officials better understand their role in the world of government finance. The new guide features “Ten Tools of P3 Governance,” a set of techniques public managers can use to increase the chances that a public-private partnership will succeed. The list includes best practices such as key performance indicators, contingency payments and routine performance audits, among others. Marlowe plans no further volumes of the financial guide — though he notes also that he’s said after volumes two and three as well. For more information, contact Marlowe at 206-221-4161 or jmarlowe@uw.edu. To access the guide, visit Governing magazine online (email and zip code required) or contact Marlowe.